The easiest way to identify a bird’s nest is to identify the birds that build and use it. Since those birds are typically adult birds in their breeding plumage, their field marks are useful for proper and confident identification. In many species, however, more camouflaged females do much of the nesting work and can be harder to identify. When birds are actively incubating eggs or feeding chicks it can be easy to get good views of the parents. It is best, however, to use a spotting scope and keep a significant distance from the nest so as not to stress the birds – if the adults feel continually threatened, they may abandon their eggs or chicks. Once the eggs have hatched, the parent birds will be very active feeding their chicks and may present good views for proper identification, and the chicks themselves can provide great identification clues. First, determining whether the chicks are altricial or precocial can narrow down the identification significantly, and other clues such as size and coloration can be useful. Many chicks are heavily camouflaged for protection from nest predators, however, and they may not always be in a good viewing position to be easily identified. Location: Where a nest is located gives a clue for the identity of its occupants. Is the nest in a cavity such as a birdhouse or hollow tree, or is it on a cliff, in a low shrub, directly on the ground or high in a tree? Some birds, such as wrens, are also well known for nesting in unusual locations, such as inside a piece of clothing on a clothesline or in a hanging basket of flowers on a porch. Size: The size of a nest is a good clue for the size of the birds that use it. Larger birds generally have larger nests. Some small birds that regularly have large broods of 5-6 eggs or more may also build larger than expected nests to accommodate the space needs of their growing hatchlings. Shape: Birds build different nest shapes, from simple shallow scrapes to cups to elaborate hanging pouches or cave-like structures. In addition to the overall shape of the nest, consider how wide or deep it is and where the entry point is for birds traveling back and forth – on the side, top or even the bottom. Materials: Birds use a wide variety of nesting materials, but most species prefer certain materials to construct their nest. A nest composed mainly of grasses and lined with feathers will be made by a different species than a nest that may be the same size and shape but is built of twigs and moss. Sticks, mud, yarn, pebbles, trash, snakeskin, spider silk, lichen, rootlets, and fur are other common nesting materials. Construction: Exactly how a nest is constructed can be an indicator of the bird that built it. Some birds build loose, haphazard nests, while others have tightly constructed architectural wonders. Examine how the nest is attached to a tree or bush and note whether it is decorated with lichen, moss, bits of leaves or other materials to serve as camouflage. Eggs: If the nest contains eggs (use a mirror on a long handle to see into a nest above your head), the shape, size, color, and markings of the eggs can also be great clues for the nest’s identity. As with observing brooding birds, however, take care not to disturb the eggs or stress parent birds that have been displaced. Never touch, handle, or remove the eggs unless they are from unprotected invasive species. Consider the breeding range of birds that could possibly build it. While vagrant birds can occasionally nest well outside their expected breeding territory, it is far more likely that the nest belongs to a familiar species. Note when the nest is actively in use and how that timing corresponds to the breeding season of different birds. Some species nest very early in the season while others nest very late, but be aware that earlier nesters may also have multiple broods later in the season. Watch for eggs from brood parasites such as brown-headed cowbirds that may look very different than other eggs in the nest. Not all birds are regular hosts for parasitic eggs, and spotting one can help narrow down the probable identities of the nest occupants. Visit a local nature center, wildlife refuge visitor center, or similar facility to check if there are any exhibits of common local nests available to study. Seeing positively identified nests up close can give you a better understanding of how to identify nests and make sense of each wild nest you spot. Just like with bird identification, nest identification takes practice and it isn’t always possible to identify every nest you find. What Bird Eggs Are You Seeing? Identify Them! When Should Bird Nests Be Removed? Dryer Lint - A Hidden Danger for Nesting Birds! 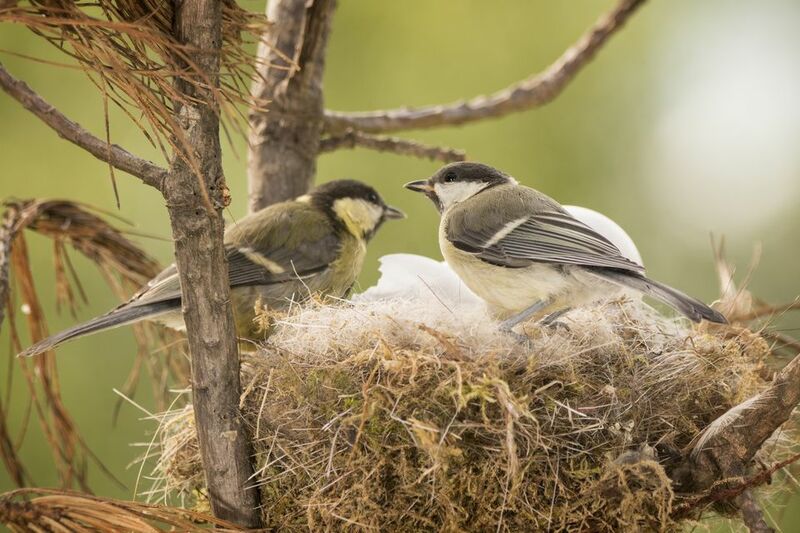 Should You Add Nesting Material to a Birdhouse to Attract Birds? Do You Wear the Right Birding Hat?